A single species of Gram-negative, encapsulated, facultatively anaerobic rods, Pasteurella multocida, can infect bite wounds caused by a number of different animals, notably cats. Cat bites and scratches can also transmit Bartonella henselae, cause of cat scratch disease, characterized typically by local lymph node enlargement, but the disease may involve other parts of the body. Streptobacillary rat bite fever, acquired from bites of rats and mice, and animals that prey on them, is marked by fever that comes and goes and a rash. The causative bacterium, Streptobacillus moniliformis, spontaneously develops L-forms. Human bite infections can be dangerous because certain members of the mouth flora with little invasive ability when growing alone can invade and destroy tissue when growing together. 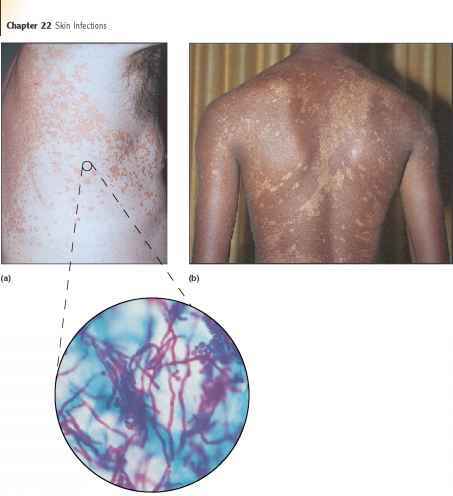 ■ What Gram-negative organism commonly infects wounds caused by animal bites? ■ What is the most common cause of chronic localized lymph node enlargement in young children? ■ What unusual kind of variant occurs spontaneously in Streptobacillus moniliformis cultures? ■ Why would normal mouth flora be a more common cause of serious human bite infections than the causative agents of syphilis, tuberculosis, and hepatitis B, which can also be transmitted by human bites?